For this month's IMBB, we have been challenged by Sam from Becks and Posh to cook and trick someone to eat a complete vegan meal without them knowing about it. Gee, that is a tough challenge as I rarely cook complete vegan meals since my food always has some eggs, cheese, milk and garlic elements. I was a bit worried too as it is not easy to trick Splashie Boy to eating something new but I am happy to report that I managed to do so last night. The only bummer was he ate everything except the couscous inari as that was not ready yet when he came over for dinner. As he had to rush off, I decided to make it later but serve the other dishes first. I had also made some vegan cabbage rolls which I served him but I did not take any pictures since I rushing to serve dinner. In Malaysia, eating vegetarian meals are quite common nowadays and is driven by religious beliefs. The Buddhists abstain from eating meats on certain dates such as the holy first and the fifteenth of each lunar month. The Hindus also don't eat meat on certain days but I am not too sure the exact dates but I do remember my Indian friend was always vegetarian on Fridays. The Chinese restaurants serve "chai" dishes that chefs have created using "mock meats" made from ingredients like gluten, a soy bean derivative. These dishes is cooked to taste, smell and look like meat dishes. I hate those dishes as I don't like how they try to imitate the taste of meat and some purists condemn this practice as unholy. I prefer the Indian interpretation of vegetarian dishes as they serve the rice or flatbreads like chapati with lentil or onion curries and a selection of vegetables and chutneys. 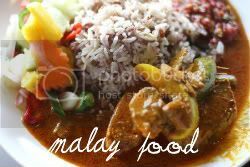 For Malay cuisine, there is no specific vegetarian dish so you will have to eat vegetable dishes instead. However as the cuisine uses a lot of sambal which is made from fermented fish/prawns, one must be careful in choosing the dish too. Inspiration for this sushi came from a book called the Complete Book of Sushi which I am currently thumbing through. The book is an excellent guide to all the different kinds of sushi you can make and this type is known as Inari-zushi or tofu pouch sushi. I was drawn to this type of sushi since it was pretty unusual as it used couscous compared to the usual rice filling which is so much heavier. To cook this sushi, first you need to prepare the tofu pouch and season it or else it has no taste. You can use abura-age, the Japanese deep fried tofu that comes in square or rectangle pieces. I have adapted the recipe to suit the vegan tastes and used a vegetarian stock instead of the dashi and omitted the sake to be added in. For the couscous filling, vegetarian stock was used to soak it that was topped only with chopped chives and a shimeji mushroom cap. As I was the only one sampling this, it was a bit hard to trick myself to thinking it is not vegan. However, I love the flavours of the seasoned inari (unlike the tasteless ones in restaurants) and the couscous filling was light and tasty. Put the abura-age into a saucepan of boiling water and boil to remove the excess oil, about two minutes. Drain and gently squeeze out the water. Be careful when you squeeze to ensure no damage to the pouches. In a saucepan, combine the dashi/stock, suagr, sake and soya sauce. Add the drained abura-age. Poke a few holes in a sheet of foil and shape it to fit inside a saucepan so it rests on top of the liquid. The drop lid allows the steam to escape but keeps the tofu submerged while cooking. Bring mixture to a boil, reduce heat and simmer for fifteen minutes. Remove from heat and cool in liquid. Drain, squeezing out excess liquid. Gently roll over each piece of tofu with a rolling pin to loosen the center. Cut each piece in half and gently ease open the cut end of the piece with your fingers to form a pouch. They can now be filled with sushi rice or couscous. In a small saucepan, bring the water to a simmer and add the bouillion cube. Stir to dissolve cube. Bring to a boil. (If using vegetarian stock, bring it to boil in a saucepan) Add the stock over the couscous in a bowl, stirring with a fork. Cover and set aside for five minutes. Fluff with a fork. In a saucepan, combine mushrooms, soy sauce, mirin and water. Bring to a simmer and cook for five minutes. 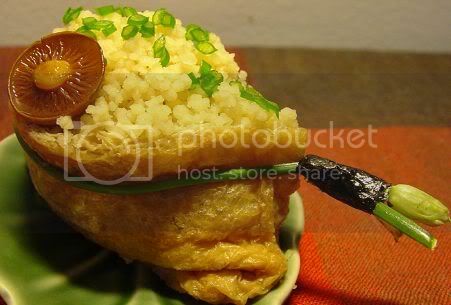 Open inari from the cut side and use a teaspoon to fill it with couscous. Wrap a garlic chive around each inari and secure with a nori strip. Sprinkle chopped chives and tobiko(if using) on top of each inari, Remove mushrooms from liquid and squeeze to remove excess liquid and arrange on top of coucous. For the second dish, I decided to get vegetarian inspiration from the book New Chinese Cuisine by Tung Lok Group who runs Lingzhi, a restaurant in Singapore that serves some wonderful dishes. I love the way they explained how the vegetarian cuisine grew in China when farmers forayed for food in the forests during the famine. 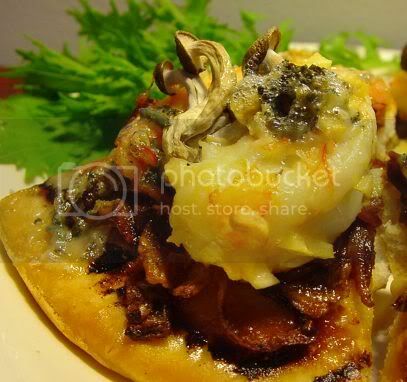 This has led to them inventing dishes from various mushrooms and fungis they have found. 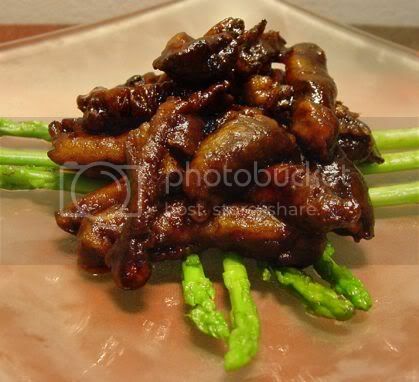 In this dish, I use this highly unusual mushroom called monkey head or bear's head. It has been recently introduced to Malaysia but you don't see many places serving it. It looks like a small cauliflower with a mild seafood taste. 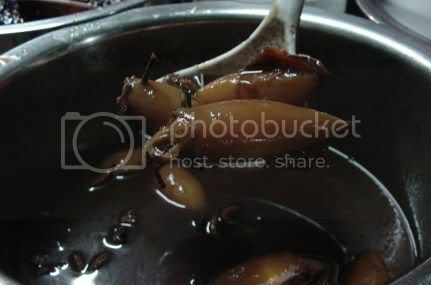 The mushroom is said to be good to stimulate blood circulation and prevent cancer. Splashie Boy said this dish didn't taste like mushrooms and was quite unusual. I liked the mushrooms and felt it had a bit of a nutty taste to it. Deep fry the mushrooms until crispy. Drain the excess oil by putting it on top of absorbent paper. Fry the shredded ginger in sesame oil until fragrant. Mix the seasoning ingredients with the vegetarian stock and bring to the boil. Add the mushrooms and toss well. Saute the spinach in 1 tbsp of oil and sprinkle salt to taste. 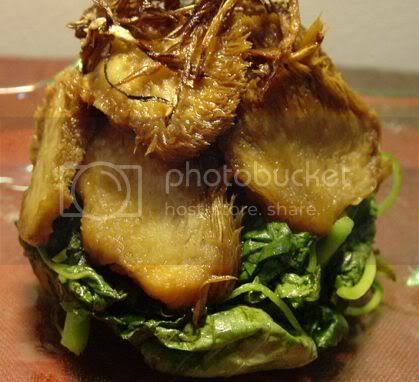 Stack the spinach in a ring mould topped with the deep fried mushrooms and the ginger garnish. 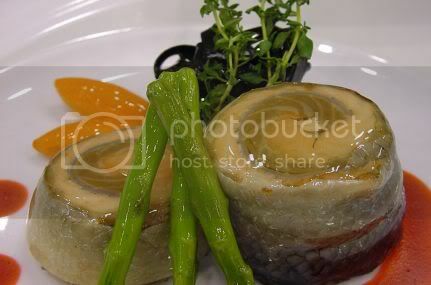 Another mushroom dish from New Chinese Cuisine by Tung Lok and this one fooled Splashie Boy totally. He thought it was sliced chicken tossed in a soya sauce and was amazed when I told him it was just mushrooms. I also liked the taste of this dish and it was pretty simple to make too. In the original recipe, they saute shredded snow peas and bean sprouts but I used asparagus instead. Integral to these two mushroom dishes is the vegetarian stock which is full of flavour and made from boiling bean sprouts, chopped carrot, red dates, tangerine peel, luo han guo and white peppercorns. Dust the mushroom strips with potato flour and deep fry them until crispy and golden brown in colour. Remove and drain excess oil. Combine the vegetarian stock and seasoning ingredients in a wok and bring to a boil. 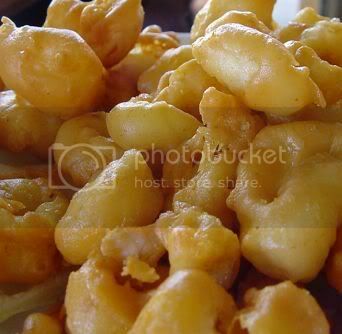 Toss the deep fried mushrooms in sauce until it is well coated. Place on top of sauteed asparagus spears. For dessert, we had something organically grown: aloe vera cubes from the garden and some organic local passion fruit I found. The recipe is actually from a lady who has an organic farm at Tanarimba, Janda Baik. You can add any fruit you wish but I added passion fruit which came from their gardens. By the way, the Tanarimba place is simply fantastic, although I have not been there, I have seen the pictures and it is so impressive. 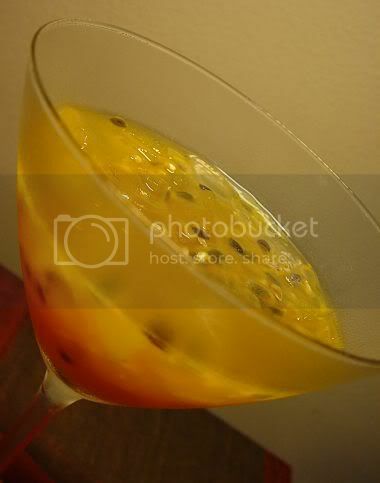 We found this dessert to be very refreshing but slightly tart because of the passion fruit. Just be a bit careful when you cut the aloe vera as it gets quite sticky and can leave stains if not washed off properly. This time around, IMBB has gone high tech, with it's own Technorati Tag, so visit it's own Technorati page for the automatic updates. Last weekend, we were at Shah Alam viewing Ms. C and Mr. D's house which is currently under renovation. Great work by the contractor so far, very neat and tidy and hopefully it gets done by early December so we can have our yearly Christmas party there. We were all hungry and thirsty so we wanted to eat around Shah Alam. Now for those of you who know Shah Alam, you will understand that somehow that place seems to lack good places to eat. Not sure why but I even know people who drive all the way back to Petaling Jaya for their meals. For the non-Malaysians, this is like driving about 30 minutes to one hour (on the highway) from your house just for a meal. This time round, Ms. C said she knew of a restaurant that her work colleagues took her to (she is now working on a project around Kelana Jaya). So we sped away there as we were all very hungry and thirsty and reached there within fifteen minutes. Although the place has no air-conditioner, it was pretty breezy. As we were all so parched (it was a very hot day! ), we quickly ordered coconut water, cincau(grass jelly) and lime juice to quench our thirst. 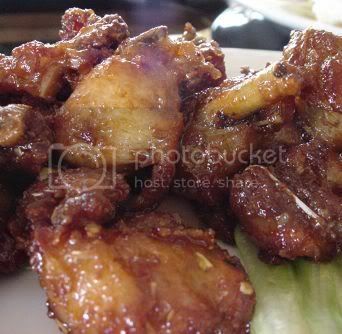 Although there was six of us, only four of us was eating so we ordered five dishes such as the Thai Fried Chicken. The dish was not too bad, coated with a sticky sweetish and spicy sauce. Usually when you go to restaurants like this, they will ask you what vegetables you want which you choose from a selection they have. 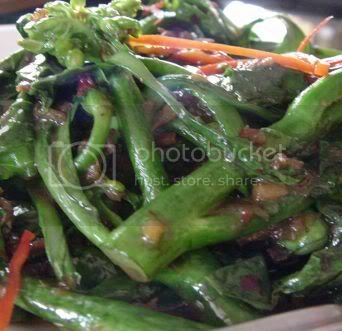 We chose the kailan which was plain fried with some chilli and garlic. We had this hot plate tofu with sauce and an egg. Not too bad as the tofu was pillow soft even though it has been deep fried. Essential stuff when you go to a Thai restaurant was their Kerabu Mango (Malay for Mango Salad). This was not too bad but was not too spicy. 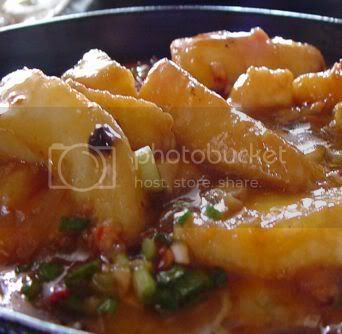 Then we had some Sotong Goreng (Malay for fried calamari) which had very little calamari but lots of floury batter. Not as good as our all time favourite one at Muhibbah but the batter for this one was pretty light. I would rate the food here to be pretty good (for Shah Alam standards) except the sotong goreng. Considering that Shah Alam has a lack of good food places, this is definitely a place you can visit when you are within that area to get a pretty decent meal. As you all know, I love Japanese food and books. 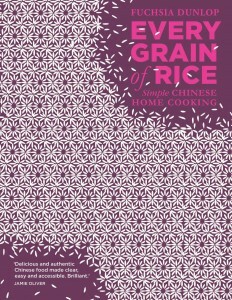 I often visit the cookbook section (English and Chinese) at Kinokuniya to browse through what is happening. When I first saw Yoshoku by Jane Lawson, I was sorely tempted to get it. However I had just found a copy of the Breakaway Kitchen by Eric Gower so I opted for that first telling myself that I will get it the next round. Sadly when I went back, all copies were sold out! So I ordered a copy and I waited and waited. It took quite a while as it seems this distributor did only one shipment a month to Kinokuniya but I am glad I waited as the book is awesome with it's Japanese food western style. For my first foray with the book, I decided to try the Japanese style pizza which contained all my favourite stuff like shimeji mushrooms, stinky blue cheese and prawns. I had not made pizza for quite a while so I thought it was high time we had some at home. Sadly the dough is not home made but the pizza bases are bought from the bake shop. I also made some chilled tofu with roasted tomatoes to accompany the pizza. 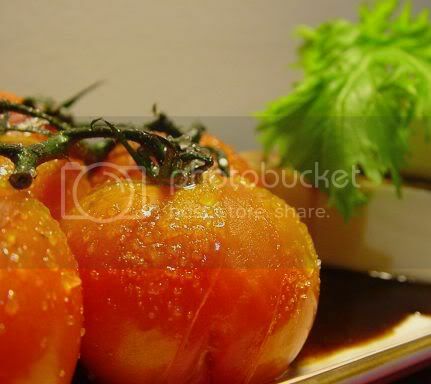 Extremely easy to make as I had bought some lovely small tomatoes still on the vine that I drizzled some olive oil and sprinkled salt and sugar. This was all roasted in an oven until they became soft and juicy. Get some chilled tofu from the supermarket (I use the ones in a block) and cut them in smaller pieces. Stack them up and serve with your roasted tomatoes. You can drizzle some balsamic vinegar on the tofu. The pizza was also simple to make especially since I cheated a bit with my ready made pizza bases. The only thing that took a while was caramelising the onions as that meant slow cooking them in a frying pan with mirin. 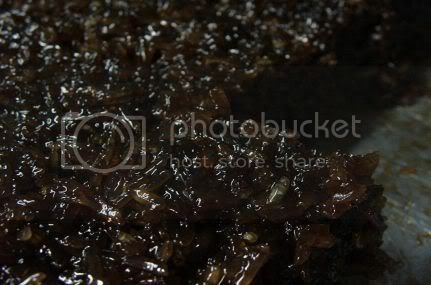 My caramelised onions were well and truly browned as you can see in the picture. The Japanese elements in this recipe was the white miso you smeared on top of the pizza base as opposed to the usual tomato sauce base and the addition of shimeji mushrooms. I had peeled and deveined the prawns and tossed them in some chopped garlic and oil before I had put them on top of the pizza base. Sadly my blue cheese melted away so you can't see it but we could definitely taste it. Wonderful combination of flavours and even though my picture does not look as nice as the one in the cookbook, the taste of the pizza is still with me. It also went well with the cold tofu and juicy tomatoes which made a wonderfully light meal. We finally made it to the Songkhla Hawker located around the Chow Kit area late last week and it was a wonderful experience. 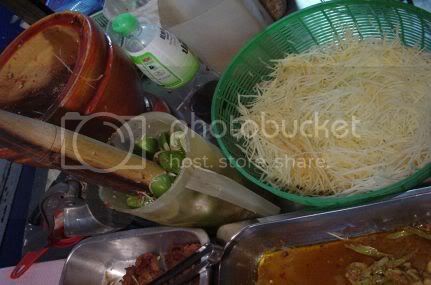 This hawker stall was first mentioned by the Fried Chillies foodsters who have done a review of this place. They also coined the name Songkhla Hawker for this unnamed stall which I think is perfect for them since they serve Northern cuisine with Thai influence. We ordered a selection of food together with the Nasi Dagang, Nasi Kerabu and Laksam. Sadly, I was not able to take pictures of what we ordered as the lighting was horrendous. Even with a flash, the food looked overexposed. Hence I only took pictures of the stall which were lit up especially the desserts as that was brightly lit with a fluorescent light. Kelantan is well known for it's rice dishes and they start having theirs from early in the morning. I still remember having a breakfast of rice, satay and peanut sauce in Kota Bahru. Nasi dagang is actually an east coast signature rice dish as it is also served in Terengganu. However in Kelantan they use reddish brown rice while Terengganu's version uses white rice. It is traditionally served with kari ikan tongkol (Malay for tuna curry) which has coconut milk and palm sugar. Songkhla Hawker's version was a bit chewy for our taste as the red grains felt a bit uncooked. However their hands down winner is the nasi kerabu which is the best I have eaten so far outside of Kelantan. The rice is coloured a nice tinge of blue and tossed with finely shredded herbs, raw vegetables like bean sprouts and chopped long beans and sprinkled with sweet fish sambal. This fish sambal is made from grated young coconut fried with shredded baked fish, shallots, black pepper and ginger that is pounded. If you are in Kelantan, they have many varieties of nasi kerabu with different colours. This is a snap I managed to take off the dishes that you can pick from to eat with your rice. The top ones look like fried fish with sambal and there is a selection of vegetables like water spinach (Malay for kangkung), long beans and cabbage. 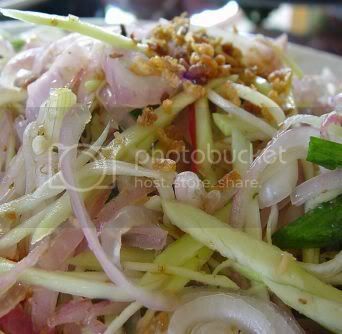 We had the famous Thai salad, Som Tam which is made from shredded mango (seen below). They will pound the dressing in that brown bowl using the wooden pestle. The Som Tam was not too bad even though it was not too spicy as I think someone ate a whole gulp of chilli padis in their portion. This is solok lada which is eaten with Nasi Kerabu. It is fish paste mixed with grated coconut stuffed in a green chilli. Really nice stuff as you get the sweet and spicy flavours when you bite into it. 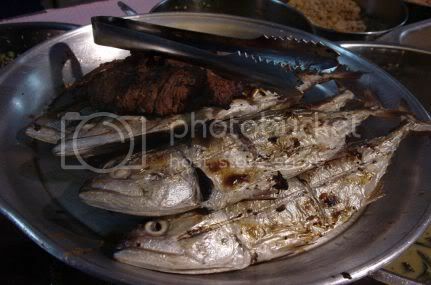 This is Ikan Bakar(Malay for grilled fish) that is usually grilled over charcoal fire. There was also a stall selling Kerang Bakar(Malay for grilled cockles) but we did not order any. We also had Kelantan laksa called laksam that was not too hot and spicy but came with a creamy coconut milk broth mixed with flaked fish. I love the broth which went well with the thick rice noodles and ulam (Malay for herbs) they sprinkled on top. 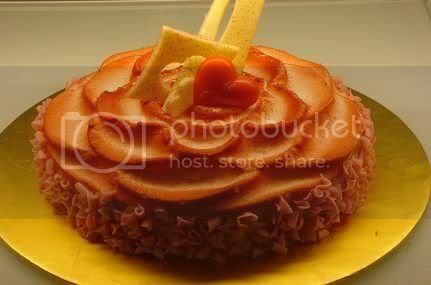 This stall has lots of desserts which was given a seperate review by the Fried Chillies foodsters. Here you have an assortment of steamed pumpkin, taro, sweet potato and tapioca. Usually when one orders the pengats below, they will add in say a piece of steamed sweet potato. This is Topak Sotong, something I have never seen before. The sotong/calamari has glutinous rice stuffed inside it and is served with a sweet broth. 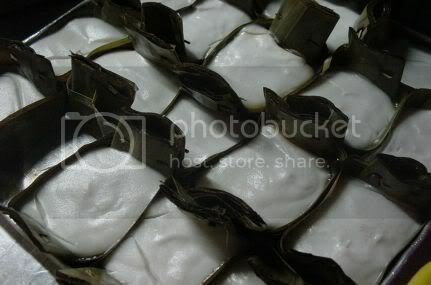 This is one of Splashie Boy's favourite Malay Kuih (Malay for cake), Kuih Pelita that uses banana leaves like a mould. The white bit is made from coconut milk while the bottom is soft jelly like and flavoured with pandan. 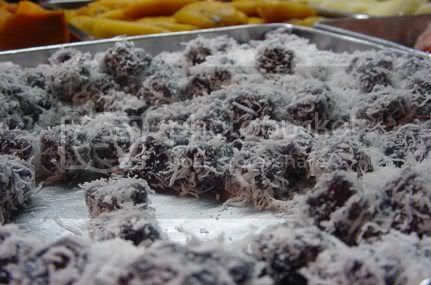 It is quite similar to the Thai dessert Tako except it is softer and does not have any water chesnuts inside it. We ordered this but I am not too sure what is this. 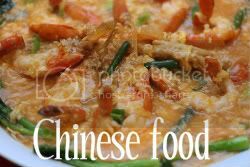 It kinda tastes like it is made from dough made from glutinous rice flour that is tossed in freshly grated coconut. They give you a gula melaka (Malay for palm sugar) syrup to dip them into. 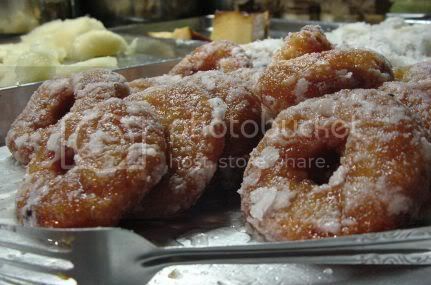 This is Kuih Keria, a deep fried doughnut made from mashed sweet potato. It is then dipped in melted sugar giving it a sweet crust. 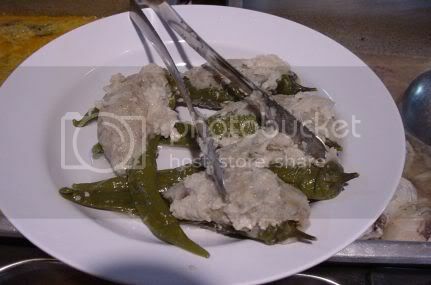 This is Putih Naga which has a slice of banana stuffed in tapioca. 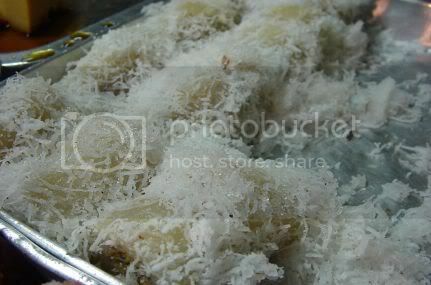 It is then steamed and tossed in freshly grated coconut. This is wajid which is made from black glutinous rice, pandan leaves and coconut milk. 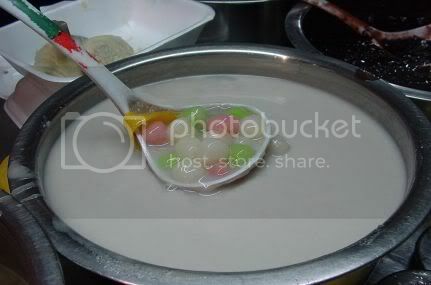 There were a variety of bubur manis/pengats that is desserts served with sweet coconut milk broths. They had Pengat Pisang (Malay for Banana), Pengat Sago (sago pearls in a cube form and coloured), Pengat Jagung (Malay for corn) and Pengat Kacang Hijau (Malay for green beans). One interesting pengat we had was these multi-coloured glutinous rice balls that reminds me of the Chinese tong yuen with slices of nangka. If you are around that area at night, do give this stall a try especially if you love Kelantanese food. Details of the exact location with a map can be found on the Fried Chillies review. Occasionally we both get the urge to just eat some steak and this time round, we decided it was time to make some at home. Hence we went to Bangsar Shopping Centre and wandered around the Cold Storage to pick up some rib eye steaks for dinner on Saturday night. We did pop over to Mr. Ho's Fine Foods that has been nicely renovated and saw some fantastic wagyu beef which we drooled over but decided it was way too expensive. When I was at the supermarket, I had a slight memory lapse so I kinda forgot that I had ran out of instant dashi granules and there was no young ginger at home so I had to omit that from the sauce plus the roast pumpkin mash. My cookbook of the week (that I was currently reading) was my copy of Yoshoku by Jane Lawson, which I just got from Kinokuniya after ordering it since end of July. I decided to pinch bits and pieces from it to make the roast pumpkin mash(which originally has ginger in it) and the mushroom sauce (which has dashi in it). The pumpkin was left over from my dessert efforts for SHF 12 and incredibly easy to make since it just involved bunging the sliced pumpkin in the oven to roast for about one hour plus. This will make it soft and you can mash it with butter and sesame oil till it is smooth. The mushroom sauce was just something I made from whatever I had in my fridge as the original did ask for a selection of mushrooms. Earlier, I had spotted some baby shitake mushrooms (my favourite) at the supermarket and bought some to keep for the next meal. You don't get these baby ones all the time so whenever I see any, I always buy a packet. I did stick to the original flavouring of adding soya sauce and mirin even though I had to omit the dashi. We also had some blanched baby pak choy as greens which was leftover from another meal we had. I must admit for a meal that was made from all sorts of things I had left over from my fridge, it was yummylicious. 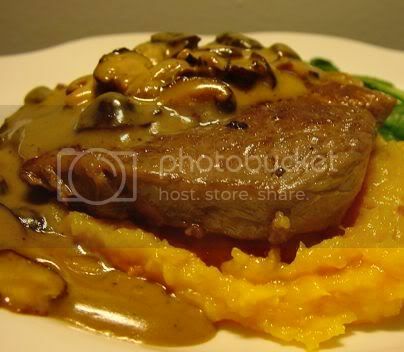 The steaks were juicy and went well with the pumpkin mash and creamy mushroom sauce. Ta da! The weekend is here again and it is time for the kitties to take over this cyber space. If you want to join us with pictures of your felines, do send the link of your post which should have the tag Weekend Cat Blogging to Clare at eat stuff. I thought I will share a cute picture I took of Meow Meow. 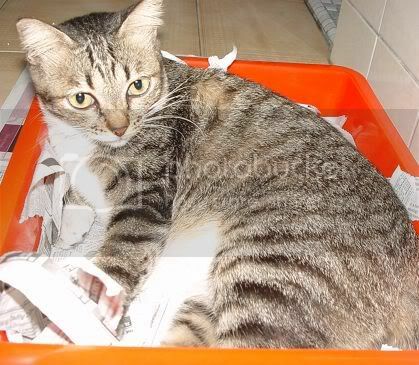 I made a new litter box with shreds of newspaper for the ginger kitten but somehow she took a liking to it and jumped in to make it a bed! So far no who has deemed it a litter box but all the cats have decided it should be a bed or a playpen. Weird kitties, they love boxes and will snuggle in it or play with the newspaper shreds. Lots of gorgeous kitties joining us this weekend so head over to eat stuff to see them all. Culinaire Malaysia and the Food and Hotel Malaysia(FHM) fair for this year is on from 21 to 24 September at the KL Convention Centre. Splashie Boy and I visited the fair during lunch and it was pretty fun to see the equipment, the cutlery, plates and the various food supplies. Some embassies/trade missons also had booths such as Switzerland with their display of chocolate and movenpick ice cream. There were also display cakes at oven equipment booths that were interestingly decorated like this one I snapped. I was ooohing and aaahing over all the equipment which I know I can't have since they are more for the professionals plus they are way out of my budget like the coffee machines, the professional gas ranges and this of course, my very own chocolate fountain. 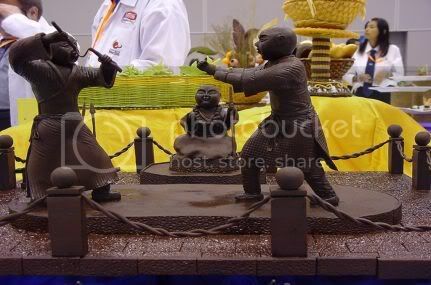 I also went to see the competition entries for Culinaire Malaysia which were super amazing. For the uninitiated, Culinaire Malaysia allows anyone in the food and beverage industry to show case their talents. I managed to see the entries for the showcase pieces and this amazing Shaolin display caught my attention. 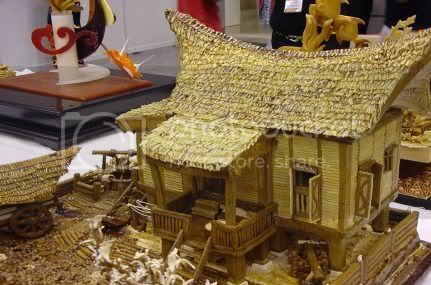 Not sure if it is made from chocolate but it sure looks good. There were also figures of the Alien creature and a Harley Davidson in chocolate. There were various traditional Malay houses but this one was called Pak Pandir's house that came complete with a bullock cart for him. 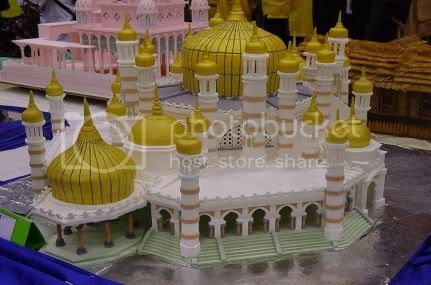 There were two mosques on display, the pink one which is the Putrajaya mosque at the back and this white one. 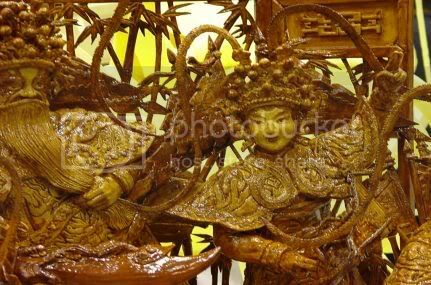 I liked these Chinese figures as they were pretty intricately done, it looked like a scene from a Chinese opera. 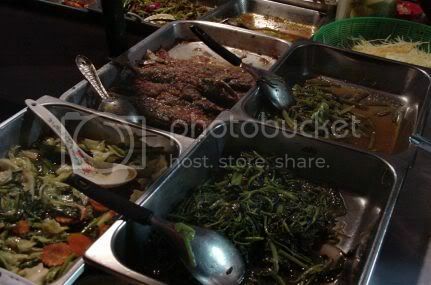 There were also plate and buffet dishes which I took some pictures. I liked this buffet piece with the butterfly and the little butterflies at the side. They looked too good to eat. They painted a gloss on top of it to preserve it (I guess?). 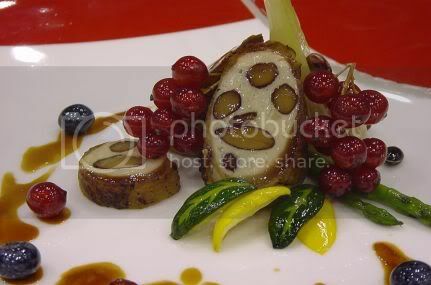 I love this one which had the red berries and the vegetable leaves. Can you see the shiny glaze on top of these salmon roulades? They look like those displays you find at the Japanese shops. If you are interested, head down to the KL Convention Centre. The Culinaire event has a RM5 entry fee and you must be in the food industry to register for the Food and Hotel Fair. 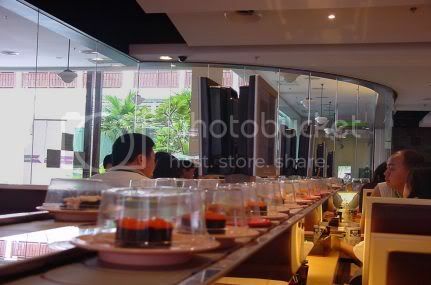 There seems to be an influx of Singaporean restaurants around Malaysia recently and one of them we were fascinated with was Sakae Sushi located at the Curve, Mutiara Damansara. I wanted to try it out since they had computer screens and it was always crowded whenever we walked past it. I kinda work on the crowd mentality where if there is a crowd, the food must be good. We got our opportunity last weekend when we ate a very late lunch so most of the crowd had dissapeared to the tea houses and cafes for tea already. Here is the picture of the cute froggie logo they have. I took it off the computer screen next to our table. If you read their menu, it has an interesting story about how they started as the founder wanted to give his wife affordable Japanese food. This is the conveyor belt system (Kaiten) for the sushi. See those computer screens, you can order from the computers which are linked to the kitchen. We didn't try that way but used the old and tried method of placing our orders with the waitress. Prices for the sushi ranges from RM1.90 to RM5.90. As I am not a frequent visitor to the other sushi places in town like Sushi King and Genki Sushi, I am not sure how they compare but Splashie Boy thinks they are slightly cheaper than Genki Sushi. I had a California Roll (Temaki) which came with a slice of avocado, a kani crab stick, shredded cucumber and a dollop of mayonnaise with some ebiko. 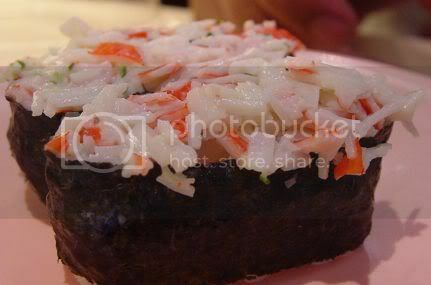 Splashie Boy loves this Kani Salad Sushi which is basically made of chopped up crab sticks mixed with some mayonnaise. Not too bad as it is chockfull of crab stick rather than vegetables. 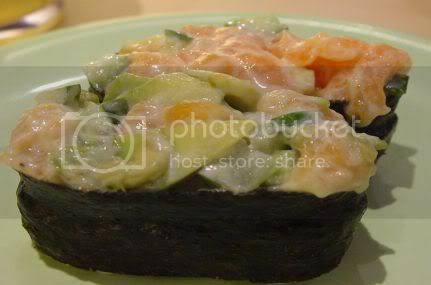 I liked this salmon avocado sushi as it has all my favourites, salmon and creamy avocado. Something unusual as I have not seen this combination at the other sushi outlets. 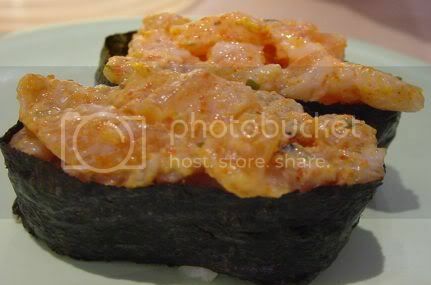 I wanted to try this spicy salmon sushi since it was also something new. It's flavours were unusual and not really to both our liking. Splashie Boy always orders a maki whether it has cucumbers, pickles, salmon or tuna inside it. 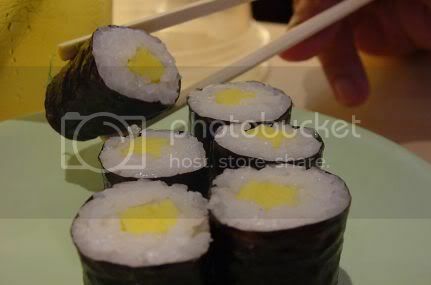 This time around he ordered a tamago maki, which has omelette inside it. Besides the sushi, we ordered tuna mayonnaise sushi, chuka wakame and two noodles. One was a gyu niku ramen for Splashie Boy while I had the cold cha soba. They really need to brush up their noodle skills as the gyu niku ramen's broth was tasteless while my cha soba had expanded a bit indicating that it has been overcooked. Splashie Boy also said the ramen was slightly overcooked too. I was glad that I managed to try the place out but I seriously doubt we will go back there again since we are both not sushi kanten fans. 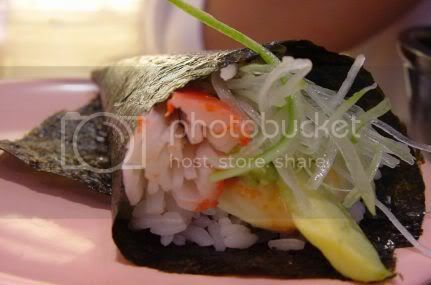 In fact, we rarely go to places like Sushi King and Genki Sushi (I think our last visit was years ago!) so we probably don't make good reviewers of this place since we can't compare which one is fresher or cheaper. 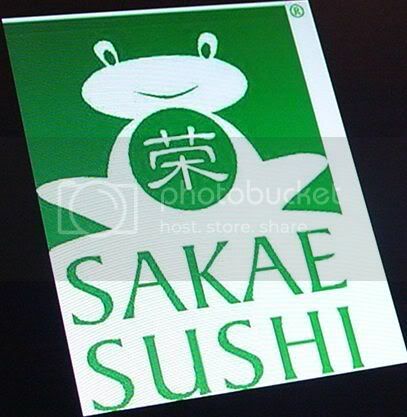 If you do go and you are familiar with which place is good, I would love to hear your views about Sakae Sushi. 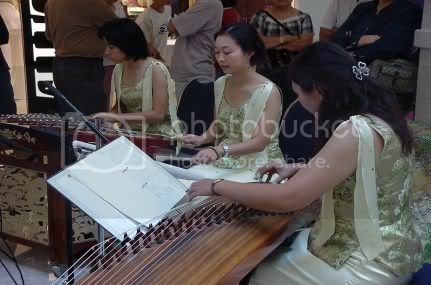 We did a quick walk about the shopping centre and stumbled on these girls giving a mini concert with their chinese instruments. The shopping centre is always quite happening during the weekends with mini concerts and handicraft markets outside. One night when we were there, we saw a group of people including kids line dancing at the courtyard too. Meme: Childhood Memories. It's all about food.